On the day of the ceremony, Bhaktisiddhanta Sarasvati met with his disciples at the Allahabad Gaudiya Math on South Mallaca Street. While he was speaking hari-katha and taking questions, Atulananda Brahmacari took the opportunity to present several devotees, Srila Prabhupada amongst them, as candidates for initiation. With folded palms, Srila Prabhupada looked up humbly at his spiritual master. He and Srila Bhaktisiddhanta were now face to face, and Srila Bhaktisiddhanta recognized him and was visibly pleased to see him. As the moment and the words became impressed into his being, Srila Prabhupada was in ecstasy. 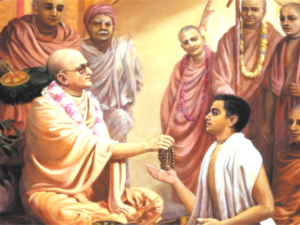 Finally, Srila Bhaktisiddhanta called for Srila Prabhupada to come forward and receive the Hari-nama initiation by accepting his beads. After offering prostrated obeisances, Srila Prabhupada extended his right hand and accepted the strand of japa beads from the hand of his spiritual master. At the same time, he also received the sacred brahminical thread, signifying second initiation. Now Srila Prabhupada was a full-fledged disciple, a brahmana, who could perform sacrifices, such as this fire yajna for initiation; he could worship the Deity in the temple and would be expected to discourse widely. Srila Bhaktisiddhanta added aravinda, “lotus,” to his name; now he was Abhay Charanaravinda.